The transition of location based services from simple game-oriented exercises to valuable review repositories is well under way. From the promise six months ago by product manager Siobhan Quinn that Foursquare's value would be from friends' tips to Yelp and Facebook Places, people are sharing their thoughts and experiences about places they shop, eat and visit. Monday night, Google jumped into this fray with both feet with the simplest, most lightweight platform I have seen yet, called Hotpot. The extension to Google Places, embedded in an update to the Maps application for Android, can be accessed through the Web or mobile. On the Web, Google hotpot starts with your home city, or places from your Web history, if that is enabled, and displays local businesses. You can rate each place with up to 5 stars, or can even present a medal if you absolutely think the place is the "best ever". 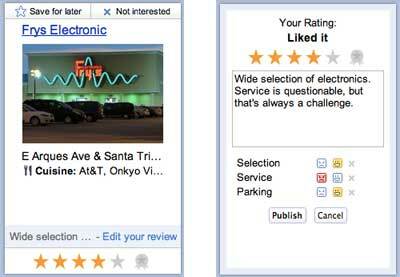 When you provide a rating, the flashcard-like places flip front to back and offer a place for you to write a simple review. Then it's on to the next card. Don't want to review an establishment? Just click "not interested" and move on. I found it only took a couple minutes to rack up about a dozen reviews, probably as many as I've ever logged in Foursquare. While some folks are projecting a massive social service from Google to take on Facebook, Google has instead referred to adding social layers to its many products. Hotpot itself presents a social layer as well, letting you connect with friends to see places they have reviewed, and cutely, posting a leaderboard, with the most active individuals at the top. The option to add friends, instead of being a "everybody in the pool" synchronization with Gmail contacts or any other database, feels more like Google Buzz - with a screen offering you the option to connect to the people you e-mail most often. When on an Android device, assuming you have loaded version 4.7 of the Google Maps app, you can add a widget to rate places for Hotpot on the fly. 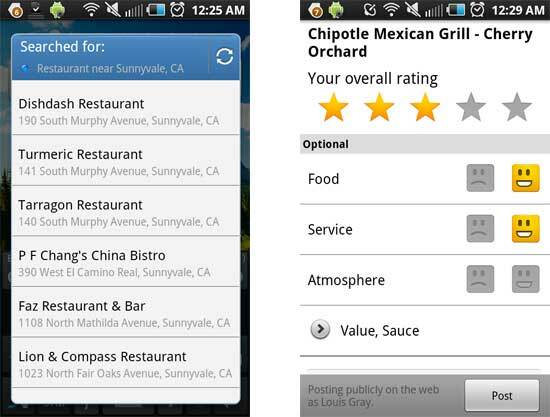 Dependent on your location, you can rate businesses, or do a quick search (for example, restaurants near Sunnyvale). 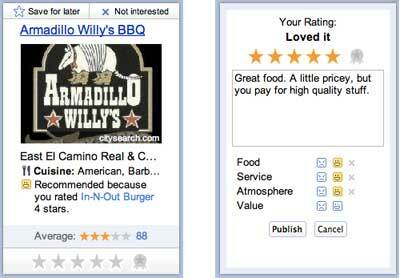 Find what you like, and as with the Web site, you can post 1-5 stars, and add a comment. For the most part, although I am sure it is not universal, it seems the majority of Foursquare users choose the app primarily to check in quickly, not to leave detailed reviews and guide to friends. This will probably remain the truth until game mechanics are introduced that push reviews. But for Hotpot, it's not about checking in that you were somewhere, but all about the reviews and providing recommendations to friends. It may have been a quiet little release pushed out from the Mountain View giant after 7:30 pm Monday night, but it could be a big deal. I have added the Rate Places widget to my Android home screen, and expect to be using it a lot. 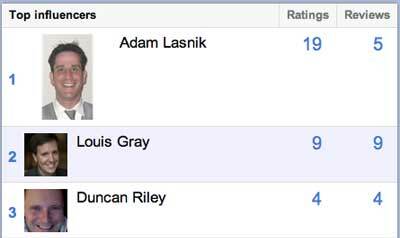 Want to find my recommendations, just get connected through my e-mail address: louisgray@gmail.com.